Although there are knock-on effects, thankfully the wine regions of New Zealand were left unscathed by the Christchurch earthquake on 22nd February, which caused so much destruction and sad loss of life in and around the city. One month later, Christchurch, the South Island and indeed the country are recovering fast and very much open to visitors. To remind people not to forget New Zealand as a fabulous travel destination, we are delighted to join in this celebration of the country in the Blog For New Zealand initiative – look out for many articles and posts 21-23 March 2011 tagged with #Blog4NZ. 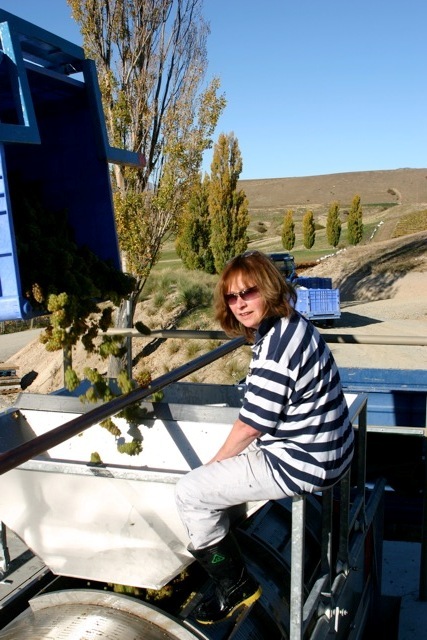 Experienced UK wine educator, judge and writer Angela Reddin knows New Zealand well, and in particular Otago where she made wine in 2004 with Felton Road. We are delighted that she has written this post for us. Although I have seen many beautiful places, visited awesome and breathtaking landscapes and met fabulous people, nowhere has lassoed my heart as has New Zealand, a country that always draws me back with ease. My focus is Otago. A region way, way down on the South Island, famous as being both the hottest and coldest region in New Zealand. Next stop is Antarctica. 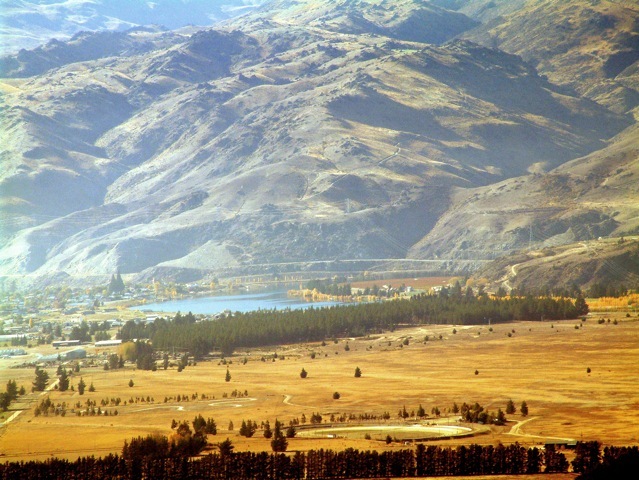 Central Otago, like Oregon in the USA and the Yarra Valley in Australia, was once a gold rush area in the 1800s. And, all three of these regions are now making ‘gold’ through their production of world class wines, with a focus on Pinot Noir. Apricots, cherries (especially cherries), plums, peaches, pears and apples all grow to perfection in this low humidity, windy climate. 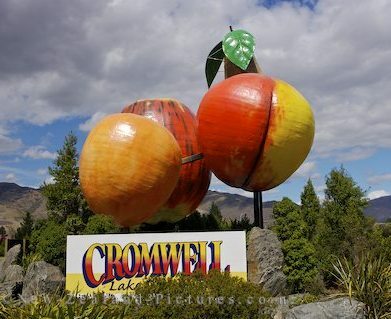 Cromwell was famous for fruit production before the region became famous for growing grapes. As you head into the town you are confronted on this flat landscape with a monumental reminder to this history of fruit farming. The ‘Sweet’ cherry season starts around 20th November, the official date of the start of summer being 1st December. Two of the most sought after varieties are known as ‘Sweetheart’ and ‘Sweet Valentine’ and picking is avid just before the 14th February. 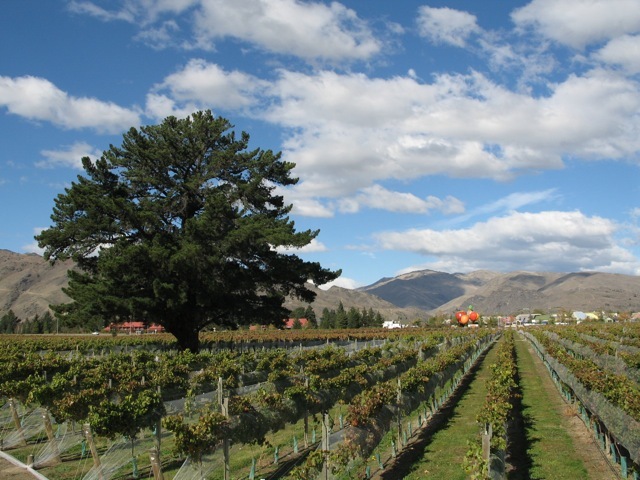 One family owned winery, who planted on the flatlands next to the town of Cromwell in 2002 had to remove many trees to get the vines established. In respect to a local tradition they refrained from removing a well loved landmark known as the Wooing Tree. When the new owners of the land heard the story of this tree and the fact that a number of the locals had been conceived under it, they wisely planted the vineyard around it and, actually named the winery The Wooing Tree after this beautiful tree. With a picnic area and restaurant alongside their tasting room, this destination is now a popular wedding venue. If apricots could thrive, it was felt this could well be an indicator for wonderful Pinot Noir, which is also very suited to the short, hot dry summers in Central Otago. Protected by the Southern Alps from the deluge of rain that make Milford Sound the second wettest place on the planet, the wine growing region of Central Otago is very, very dry in the summer and the vines need irrigation when they are establishing. The north-west winds dominate and keep the region’s vines relatively free from some of the fungal diseases that can attack the grapes. It may have a whole list of other things going for it from extreme sports (think bungee-jumping, waterboarding or helicopter skiing) to pristine countryside (remember Lord of the Rings? ), but for some of us, today the most famous claim regarding Central is for the wonderful, exhilarating, lip-smacking world class wines that are produced here. The potential of what can be achieved has drawn a host of young gun winemakers to the region, most of whom have rooted themselves very happily and are drawing ever more attention for their sumptuous offerings. If you are visiting wineries on your own, transport is essential and note that distances can be longer than you might at first think in this vineyard region, being a series of valleys nestling between mountain ranges and spectacular gorges. As an alternative, you can take some excellent packaged wine tours that can also include gourmet food and a knowledgeable guide. Wherever you choose to stay in the region you will be spoilt for choice with a full range of options from luxury lodges and hotels to B&Bs and backpacker beds. Queenstown and Arrowtown are both good places to base yourself with vibrant restaurant scenes. Queenstown is one of the most jazzy spots anywhere in the world; in the historical gold-mining village of Arrowtown visit the Lake District Museum for a very good historical local overview and do not miss eating at Saffron, a wonderful restaurant at which you will often find the local winemakers. 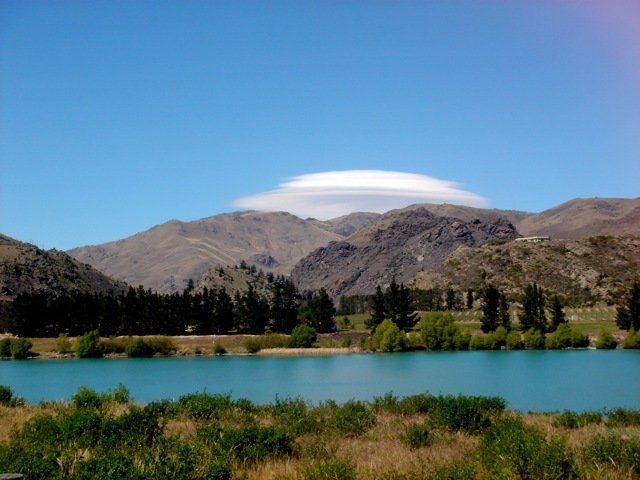 Lake Wanaka or Cromwell offer fantastic alternative bases. There is no life and love without wine. But, many of the wineries in this area are small, indeed very small, and may not have visitor facilities. Those that do, offer a truly exceptional experience, some with terrific restaurant facilities making use of local produce to perfection by very talented chefs. A must visit for cellar door facilities and its restaurant should be Carrick Winery with awesome views and just exceptional food. Another world class winery with restaurant facilities is Amisfield Winery and Bistro. Situated on the Lake Hayes Road in Lowburn, just after the Arrowtown turnoff, it is just 15 minutes’ drive from Queenstown, with stunning views of the Remarkables mountain range. Anyone for the Rugby World Cup? A ‘Trust the Chef’ menu could take all the worries of what to eat away from your tired brain and into the very safe hands of the restaurant team. The wines are also wonderfully expressive of this very classy winemaking region. About half an hour from Queenstown, just beyond the famous A.J. Hackett’s bungee jump bridge over the Shotover River in Gibbston Valley you will find the Peregrine Winery. One for the architectural visualists amongst you, its roof is shaped to resemble the wing of a Peregrine in flight, and it is rooted into the landscape in a way that is intrinsically part of the surrounding vistas. Peregrine has good cellar door facilities open from 10am to 5 pm. Wanaka is probably the most stunningly visual place to stay in New Zealand, with hanging glaciers, beautiful lake front accommodation and the rest of Central at your toes! 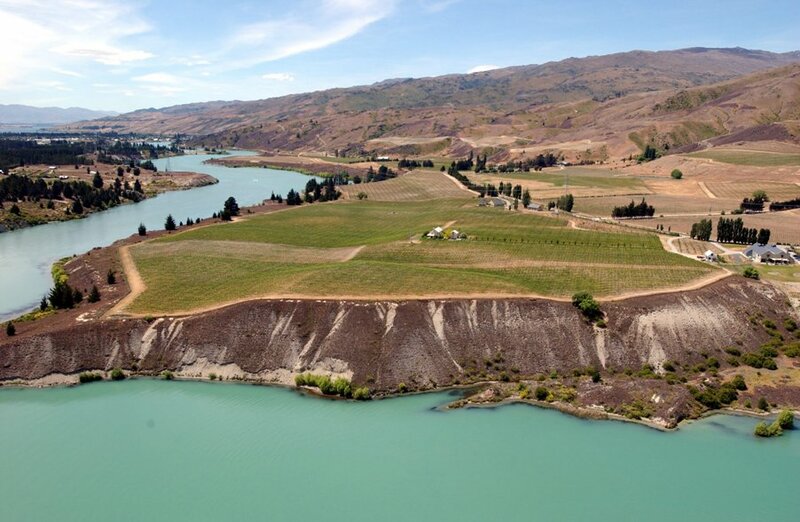 Rippon Vineyard, one of the most scenic and most photographed vineyards anywhere in the world, also hosts a biennial music festival, and there will be a special Quake Relief concert in aid of the Red Cross on April 2nd. Of course, while you are there, do try these beautifully expressive, top class wines crafted by second generation winemaker Nick Mills. Cromwell has a whole host of wineries clustered on the Lake Dunstan Estate on McNulty Road, including the Central Otago Wine Company, affectionately known locally as CowCo. Winemaking legend and rock star lookalike Dean Shaw handles the juice with ease. Partner Sam Neill, film actor legend, who looks like himself, and owns the Two Paddocks brand, can often be found trying to help Dean. An appointment is needed to visit. Also on the McNulty Road and not to be missed is Quartz Reef Winery, the lair of Rudi Bauer, an Austrian who so fell in love with the area (and his wife) that he settled himself in this land very happily. Although only in his 40s, he is known as the grand old winemaker of the region because he was the first qualified winemaker to work here. Beautiful sparkling wines, which he still tends to by hand only, lead the way to his equally terrific Pinots, both Noir and Gris. Cellar door opening times are 10 am to 3 pm or by appointment. The Cornish Point Vineyard is owned by Felton Road Winery and makes an exotic and very beguiling single vineyard wine that sits wonderfully well in the Felton Road stable of thoroughbreds. Though it is very hard to choose the ‘do not miss’ winery in Central Otago, if I must, my recommendation has to be Felton Road Winery even if I am obviously biased. Sited in Bannockburn, this is quite possibly the best Pinor Noir producer in New Zealand and that puts this small winery firmly into the list of the world’s top class producers. You will need to call to make an appointment to visit from 2 – 5 pm, but be assured you will leave with a grin as wide as Lake Dunstan after tasting there. Also well worth visiting along the Felton Road itself Mount Difficulty, Olssens and Desert Heart. The Felton Road team has made history through their incredibly generous commitment to assist the victims of the Christchurch Earthquake disaster. They offered all of their UK stock of sampler cases to the UK public from which every single pound paid would be sent straight to the earthquake appeal. Publicized through some of the top journalist websites and on Twitter and Facebook, the offer reaped an astonishing, fast response from the UK with every case sold within a matter of hours, raising over NZ$47,000. I snapped up the very last case and offered this, as well as a Magnum of Block 3 2001, to the Association of Wine Educators’ auction with Bid for Wine in aid of Wine Relief, the UK wine trade’s Comic Relief effort. This case was sold for £405 which meant it raised £665 between the two charities! This beautiful land, its people and their wines call to me from afar. If you can, travel to this siren like country and experience the wonder that is New Zealand. Central Otago Pinot Noir is the official regional wine association and the site includes web links for all the region’s wineries. Otagowine.com is a portal for the promotion and wine sales from the region and includes plenty of local resources including a map and member listing for wineries on the Central Otago Wine Trail. Centralotagonz.com is the main local tourism portal. Queenstown Wine Trail offers well organised tours for beginners or connoisseurs with a number of winery visits, garden tours etc. Appellation Central Wine Tours provides an excellent and very professional guided tour for smaller groups. Luxury vehicle, scenic tours with gourmet food and wine tastings. Over the Top provides a very different way to visit the wineries. Helicopter visit to two wineries and a gourmet picnic high in the mountains. 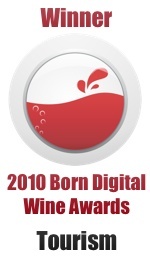 This entry was posted on Monday, March 21st, 2011 at 11:42 pm and is filed under Vineyard Visits, Wine Tourism General. You can follow any responses to this entry through the RSS 2.0 feed. Both comments and pings are currently closed. Thanks, Matt. Yes, it’s been 15 years since I went and desperately want to return.